At the same time we are taking in refugees from the Mid East. 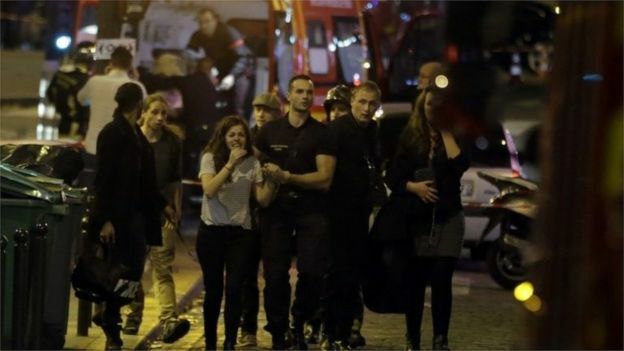 Islamists attack Paris killing Hundreds of innocent people. Just before the attack was announced on the news, it was also stated that the UK has paid for special chartered flights bringing into the Hundreds of Syrian refugees into the country. When are we going to learn the lesson that these people hate us with a vengeance. It's important to understand ISIS. I understand the assalt in France was from French Nationals and the threat to Belgum are Belgum Nationals. Point being that people fleeing ISIS if vetted shouldn't be any more of a problem than home grown violent individuals. That lends creedance to governments spying on their own citizens. I disagree with the NSA model to collect everything. There doesn't seem to be evidence that the collect everything model pinpointed terrorists within or outside the country. Secrecy within the intellegence community may make them feel that disclosing planned terrorist attacks they prevented for fear of disclosing collection methods. They should gloat over attacks they stopped if for no other reason than to justify the money they collect and the breach of privacy most of feel we should have. It appears that collecting everything makes a pile to deep to sift through. I'm hearing more intellegent agents are needed on the ground to identify threats. Imagine how many intellegence agence we can have on the ground for what's being spent on huge data centers. Here are links to two authors discussing their books about ISIS. The first is 49 minutes the second is just over an hour. He spoke in the C-SPAN 2/BookTV tent at the 20th annual Texas Book Festival.â€‚The festival was held from October 17-18, 2015, at the State Capitol and surrounding grounds in Austin. Abdel Bari Atwan talked about his book, Islamic State: The Digital Caliphate, about the rise of ISIS* and the methods the organization has used to take over much of Syria and Iraq.â€‚He also talks about the rivalry between ISIS and al-Qaeda. During this event, Abdel Bari Atwan, who joined from London via Skype, was interviewed by Fred Lawson, professor of government at Mills College in Oakland, California. I used to think weeklies were better to present news - unti the O.J. Simpson case which covered the court case and lead the weekly cover for months. The San Bernadino California U.S. shooting is another travisty. Early reports were there were three shooters. As I hear now that would make one of them, a six month old. Last month, when a Colorado Christian entered a Planned Parenthood clinic and fatally shot three people, the mainstream media rushed to make the connection to “right-wing domestic terrorism,” even though police hadn’t made any connection and the evidence was thin. When two California Muslims shot up a government office several days later, massacring 14, national journalists refused to call it Islamic terrorism even though evidence of the shooters’ motive was overwhelming. Yeah, & the largest gun sales ever.......happened afterwards! Now the US residents are being told to open carry! As I've said before.......the answer to everything is more guns!!!! Its NOT WORKING!!!! Isn't it long past time to change up & try SOMETHING ELSE!!!?????? GROW UP & give up your dangerous toys!!!!! The ''right to bear arms'' stubbornness is beyond comprehension, so you may as well all shoot each other & get it done with!!!! I don't much like my mother, but its better she moved back here than to stay in California after dear 'ol father died. Respect for the USA has nose-dived big time, but what do you care, nobody else is as good as you. If it isn't about the US, its not worth knowing. I received a telephone survey call about abortion and right to life a few munutes ago. I politely disconnected and find it interesting how much these atrocities are capatalizied upon. Classes were cancelled Tuesday at the Mississauga, Ont., school that's at the centre of a controversy after a CBC News investigation found four women who studied there left Canada to join ISIS. Eagles of Death Metal link to theology is at Low Gap, North Carolina. The band also played in Israel before Bataclan. French word bataclan: "stuff."